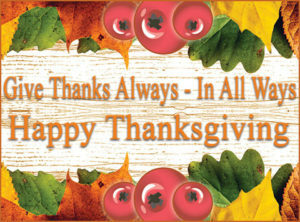 Blog - Page 2 of 7 - Peabody Engineering & Supply, Inc.
Thanksgiving 2018 – We Hope You Enjoy This Years Thanksgiving Letter. Our office will be closed on Nov 22nd and 23rd, 2018. Well, it’s almost Thanksgiving 2018. The official start of the Holiday Season. Retail Shopping Centers and Warehouse discount stores already have Christmas decorations on display. Amazon is flooding our inboxes with shopping ideas. Our relatives are making plans for family gatherings, making airline reservations and dusting off the decorations that will transform our homes into wonderous cathedrals of holiday merriment. We just finished with Halloween, changed our clocks and voted in what may prove to be one of the most contentious elections in our lifetime. America is deeply divided as self-righteousness, intolerance and narcissism has rampantly gone out of control. Gone are the days of respectful disagreement and forbearance of differing opinions. It seems that there is no longer room for compromise and there is no middle ground. On the one hand is traditional American values, pursuit of one’s own concept of the American Dream, building individual success, time with family and pursuit of your passions with as little interference from government and outside interference as possible. On the other hand, is a coalition of fragmented special interest groups with nothing more in common with each other than a swarm mentality that is willing to compromise everything else to get the one thing important to them, whatever that one thing is. 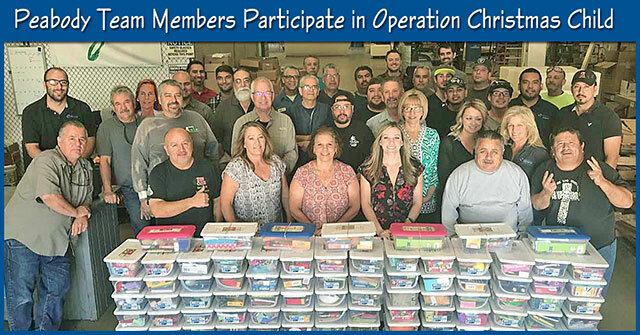 It is with great joy and big hearts that Peabody Team Members participated in Samaritan’s Purse Operation Christmas Child. Peabody Engineering gladly participates to help support this awesome cause for Samaritan’s Purse. Going to the stores to pick out gifts for the children is probably half the fun of this project. Getting together to put the Shoe Boxes together is another part of this project we enjoy. We set ourselves a goal this year and not only did we make the goal we went over the goal. With lots of love we send these Shoeboxes out into the world so that it may be a blessing to a child who might not otherwise have anything for Christmas. “Thanks be to God for his indescribable gift!” 2 Corinthians 9:15. G.E.M. Going the Extra Mile is an achievement given to a Peabody Team Member for exceptional contributions to the company’s success having gone above and beyond to help fellow Team Members meet and exceed work expectations. 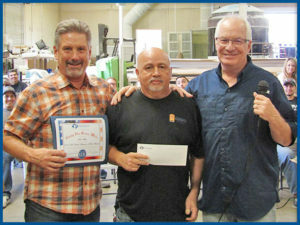 All Peabody Team Members have an opportunity to nominate another Team Member for the award. It is a monthly award. 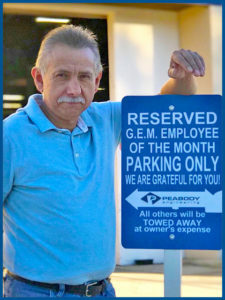 Nominated by his fellow Peabody Team Members – Congratulations to Ricardo Coronado who works in our Custom Cellsite Concealment Department, on being October 2018 G.E.M. Winner! Will help anyone any time. Works very hard – follow directions and always looking forward and trues very hard to communicate with others. He gets along with everyone. 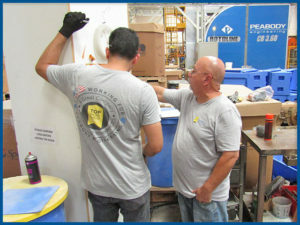 Nominated by his fellow Peabody Team Members – Congratulations to Alex Avila who works in our Custom Engineered Tank Department, on being September 2018 G.E.M. Winner! 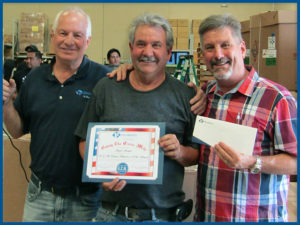 Alex consistently shows up to work and does his job with a good attitude. He is a positive person and I have never heard him complain about anything. Alex is always willing to help and step up. Always friendly and has a smile on his face. I would like to nominate Alex for G.E.M. of the month. He is always happy to see you. He always let me know when they are working on tanks that have special configurations done to them so that we can get photos taken. He is kind and respectful and if I have needed something he has always helped me. Alex is always willing to help, he is always in a good mode. 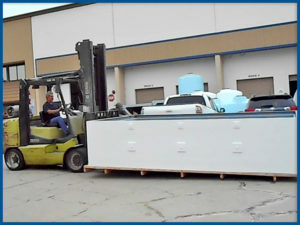 We have been short handed in Engineered Tanks, Alex helped pick up the slack and knows when things need to be done ASAP. He is a “Can Do – Will Do” person! All around respectful nice guy! Always has a smile on his face and has a great attitude. 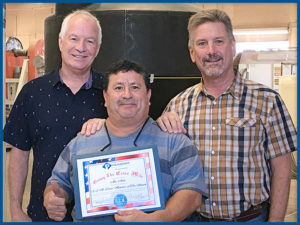 Nominated by his fellow Peabody Team Members – Congratulations to Art Avila who works in our Rotomolding Division making our Peabody Tanks and Tank Related Products, on being August 2018 G.E.M. Winner! I believe Art needs to be recognized for his ability to work in the heat right in the middle of the ovens and continually produce top quality products with the least amount of scrap. Making sure all pieces come out 100% good. Art does a lot of working running Charlie by himself back there. I am sure its not easy being in the back coroner in that heat, but I never hear him complain. He is always very friendly and makes an effort to say hi to me and ask me how I’m doing. Art works well with others and enjoys teaching our temps a new trade. He is a happy person which makes a good working environment. Art is always friendly and will treat you with respect. Art has worked solo on Charlie, no complaints and he just gets the job done. He always has a smile on his face and is very friendly. He pays attention to detail. He molds our tanks with minimal problems. He expects excellence from himself and others. 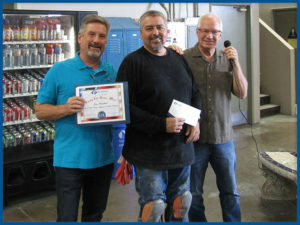 Nominated by his fellow Peabody Team Members – Congratulations to Jesse Aramburo, who works in our Custom Fabrication Department, on being July 2018 G.E.M. Winner! Will help in any department at any time. Always looking for more to do. Any time or any department he will always do a great job. He is a good worker. Jesse was a temp before he started full time at Peabody Engineering. You could tell right from the start that he was a good fit with the Team. He just has the best attitude and loves to work here at Peabody. When Jesse would see new temps here he would tell them, “show up on time, do a good job, this is a great place to work”. He always encourages everyone. Such a positive attitude. One day Jesse told me that Peabody had done more for him in 2 months than previous employers had done for him in 30 years. WHAT a compliment. Jesse is true to his word. If asked he will tell you the truth and wants to help Peabody be the best it can be every day. He also likes to mentor and train new employees. This is why I wanted to nominate a man that invests into other Team members. What a blessing he is to have at Peabody Engineering. 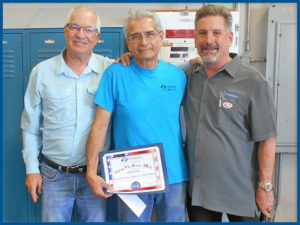 Nominated by his fellow Peabody Team Members – Congratulations to Jorge Arroyos who is our Production Foreman in our Custom Fabrication Department, on being June 2018 G.E.M. Winner! I think Jorge did a good job handling things when Armando was gone. There were even a few things he helped me with. He’s always very friendly towards me which makes working with him easy. Jorge stepped up in Armando’s absence and helped keep Production running. Jorge is stretched in a lot of directions and has adapted well. He brings a sense of Humor to tough situations, he keeps a balance between getting the job done and ensuring it is done right. 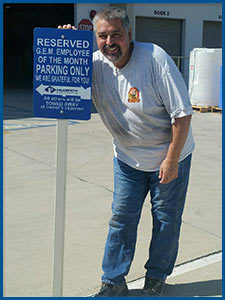 Besides his daily duties, Jorge is allover the warehouse helping other departments. Jorge is definitely a great example of a leader. 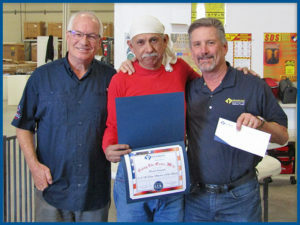 During Armando’s absence Jorge continued to push the work agenda through no matter what challenges are thrown at him he seems to get the job done. Without hesitation Jorge is always willing and able to step in and lend a helping hand. His eagerness in wanting to help you succeed in your job is a testament to his character. He works hard, he keeps projects moving forward, he provides solutions and always with a twinkle in his eye he has never let me down in helping with whatever challenge I need help with. Wednesday, July 4th, 2018. The Day that The United States of America Celebrates her Independence. This is the 242nd anniversary of our Independence and sadly, these days, much of our population have no understanding at all what we are celebrating. If you really want to know what it means, it seems you must ask either someone over 50 years of age or a naturalized citizen, both of whom were taught the truth of this historical event in the classroom. Unfortunately, in many classrooms today, the significance and impact of America’s independence is minimized in the interest of what people call “moral relativism”. Essentially, that supposedly means that right and wrong, good and bad, is all relative, based upon your culture or perspective, so what may be “good” or “honorable” to one may be “evil” or “dishonorable” to someone else from a different background. This way of thinking is totally contrary to what America is all about. Somewhere, we’ve lost our way and failed in our responsibility to pass down our core values to the next generation and that must be fixed. Our Nation’s courageous founders were from Europe. They were mostly of Anglo-Saxon decent and left their homelands because of religious persecution. 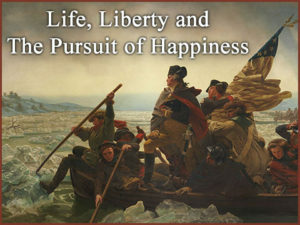 They were looking for a new life in a new world, a wild, untamed land, where they could establish a free society, not under the rule of a monarch, but instead under the rule of the Almighty God, where they were free to worship in their own way and live their lives as free men and women subject not to a government, but only to Our Heavenly Father. The early settlers did not come to America as racists or conquerors and had nothing but noble intent. They came to the new world with faith and a desire to honor God and live a better life. During the war for Independence from England, the young society’s leaders, men like George Washington, Thomas Jefferson, Samuel Adams, James Madison and others risked everything for that dream. Many lost their homes, their possessions, even their lives. But they prevailed and won! In the process of deciding how to govern this burgeoning nation, they prayed to God for wisdom and discernment to create a Free Nation, where every man had equal rights and the freedom to pursue their own passions and dreams for a better life. Through the study of ancient civilizations and history, they examined what type of government would work to insure a sustainable system of rule while insuring individual freedom and liberty for themselves and all future generations. 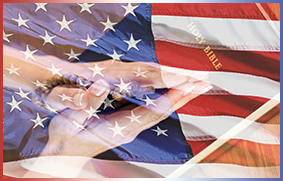 The result was clearly God-inspired and created The Constitution for a country that would become the most successful, greatest nation in the history of mankind; The United States of America. Nominated by his fellow Peabody Team Members – Congratulations to Martin Ochoa, who works in our Tank Preparation Department, on being May 2018 G.E.M. Winner! Always offering help – always acknowledges the women with respect. Does a great job with the pump shelves, they look great. Martin is always so positive any time I have seen him. Always kind and respectful. 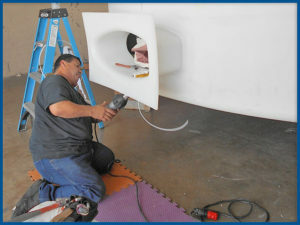 I see him working on the Pump Containment Enclosures mainly and he gives it his full attention, making sure they are prepped, put together and clean. 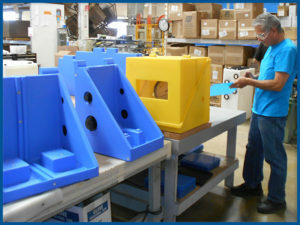 He ensures the quality of the product is up to the highest standards of Peabody Engineering. If another department needs a helping hand I see him without hesitation helping his fellow Peabody Team members. He has a genuine caring way about him. Martin works hard at getting our pump shelfs out. He takes great pride in his work. He always says Good Morning to me with a smile, he makes sure he tells me Happy Mother’s Day. Martin will let me know when he is low on parts, so he never runs out. He does such a great job on our pump shelfs. I can’t recall when we had any come back because of a bad part.